Our spelling worksheets are in levels by grade. All of our worksheets offer practice and these offer practice of the correct spelling of words. Oh, how we know the agony of a child finishing his spelling homework, only to find that he copied the wrong words or the wrong spellings! 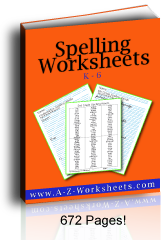 You can use these worksheets to print the spelling words that have space for students to practice copying the spelling words three times. This way your kids can copy the the correct spelling of words with easy confidence. Once your student knows the basic phonics sounds he can practice those words on our short vowel sounds worksheets and our blended phonics worksheets below. Offer more practice for the sounds you are teaching, several of these worksheets below are several pages long so you have fresh material through the week. Sometimes choosing a higher level is intriguing to children and challenges students. Many times I've found students who didn't "get it" with reading until they had to work through longer words. Longer words are the first time that some children understand that they can usually figure the word bit by bit - a most necessary skill for higher level reading. Almost any child who knows the basics can learn any spelling words with sufficient practice. I like to teach, "Say it! Write it! Repeat it!" An easy way to increase the level of spelling skills is to teach the prefixes and suffixes that are most commonly used. Once a student understands the spelling and definition of the prefixes and suffixes he can build words from the words he already knows! Another old timer said that a way to learn the correct spelling of words is to keep a personal spelling notebook of the misspellings in daily writing. This way a student can review the only the troublesome words from his own spelling word lists. An excellent idea is to create your own spelling worksheets by writing the right word in the top space on our blank spelling worksheets on our different levels of printable writing paper so that the word is spelled right for your student to copy three times for practice. Be encouraged to use your own lined writing paper, too. Personally, I enjoy keeping note while my own child is reading of which words he must sound out, making a handwritten list of those same few words as he watches me shape and hears me sound them, and letting him copy those same words three times each. Once he reads the selection again it is so much easier and it is a joy to see his face at his success. An incentive here is to let him know at the beginning that the fewer words he has to decode, the fewer words he has to write! Teaching writing to young students is much easier when there is an example of the words before the student with the correct spelling and a correct formation whether manuscript or cursive writing. It is so important to voice the sounds of the letters, that's what phonics means, sounds. Much of "how to spell well" depends on good pronunciation and practice sounding the words well. Short vowel sounds are nearly two-thirds the "work" in teaching reading. Spelling can help a child read new and unfamiliar words if he also knows how to sound the letters. Teaching spelling requires first learning the alphabet and its sounds as well as how to write the letters. After that, any spelling word lists can improve a child's spelling if they have time for practice. Practice makes perfect! I like to have my students say the word, spell it, say it again as is the protocol with spelling bee words; yet for practice, repeat three times. Young students need someone to do this with them so that they can form the habit. We offer tracing the correct spelling of words for early childhood tracing, copying beautiful manuscript or cursive writing; on up to weekly spelling lists and vocabulary worksheets. Be encouraged to try a higher level! Your student might like working on new words and rise to the challenge! Phonics lessons and vocabulary lessons are great opportunities to learn spelling! 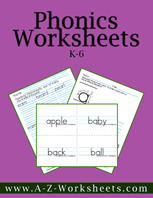 Go to our Phonics worksheets page for practice phonics worksheets. 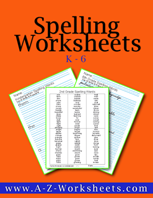 All of these Spelling worksheets offer practice words for Spelling practice with different levels of increasing difficulty. Each word is offered with space to copy the Spelling words three times each. Print and reprint as often as your students need practice worksheets.